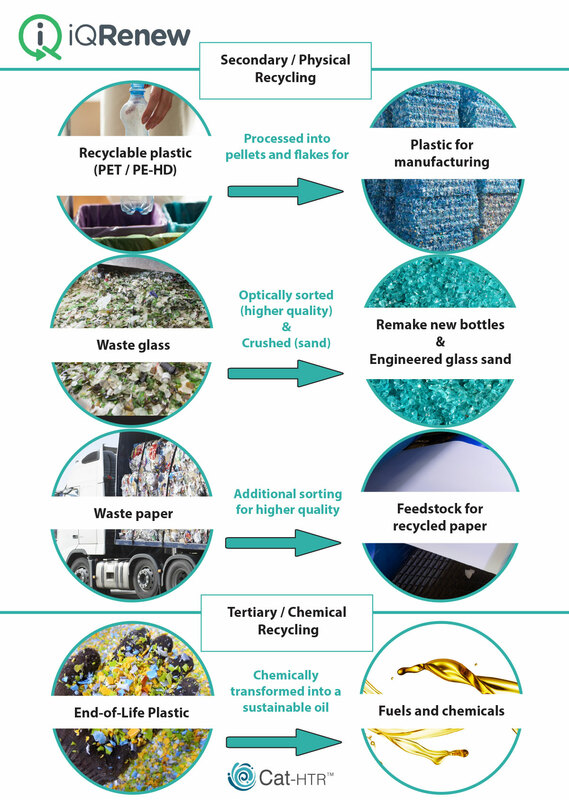 A MRF, or Material Recovery Facility, is a huge and fast-paced factory where mixed recycling comes in to be sorted into its various recyclable streams – plastic, paper, glass and aluminium. Some of the sorting is done by hand, but most is automated and done by machines. The end recyclable materials are then bailed and sent on for processing into new products. At one of iQRenew facilities we sort 30 tonnes of recyclable waste per hour. This facility alone saves 105,000m3 of landfill a year as a result of recycling. This equates to 20,000 tonnes of greenhouse gases being reduced a year, the equivalent of removing 4,582 cars from the road. iQRenew is an Australian company formed by Licella™ following the award of a grant from the Australian Government. 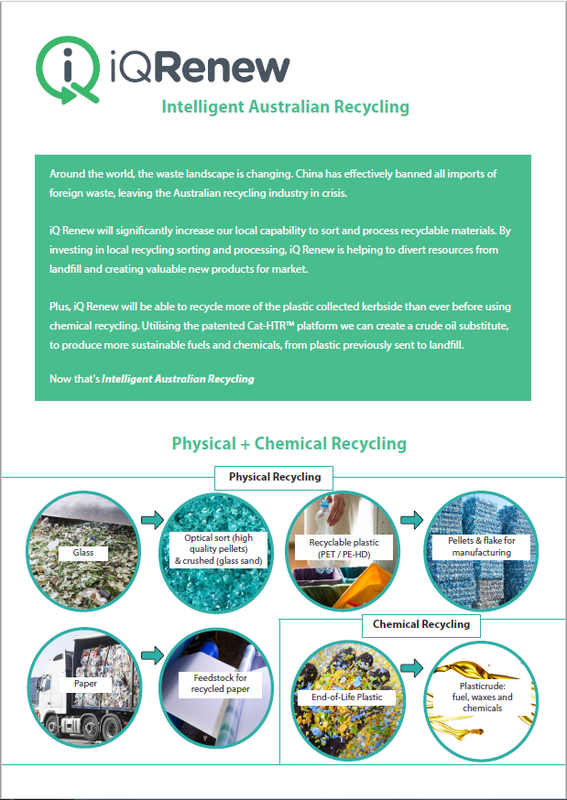 iQRenew will deploy Licella’s Cat-HTR™ chemical recycling technology in Australia, alongside expanding its physical recycling operations. The Cat-HTR™ uses chemical recycling to convert residual plastics (those plastics otherwise sent to landfill) into fuels and chemicals. Licella™ partners with sustainable feedstock providers for its Cat-HTR™ technology. For more information on Licella™ and the Cat-HTR™ technology, view this video. 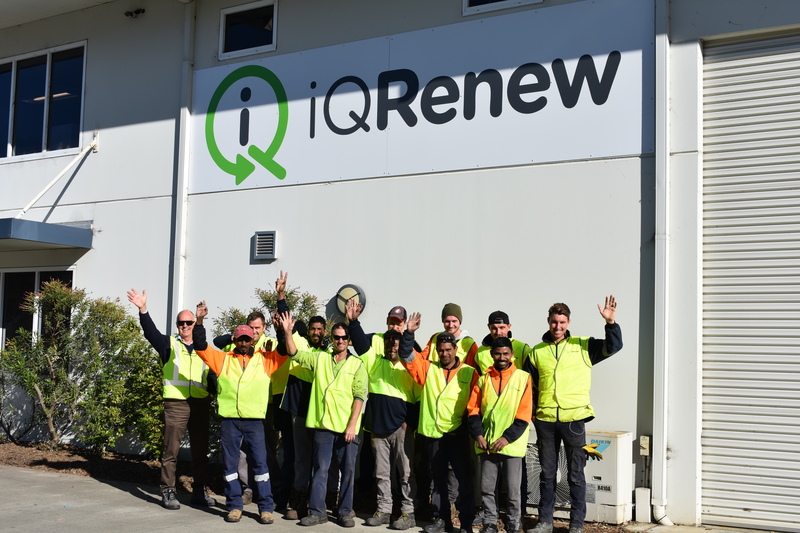 Available now to download – a short 2 page brochure about iQ Renew, our recycling technology and resource recovery solutions.